You can easily make a range of dolls house and other scale miniature butterfly koi for model water features and ponds. Koi have fairly simple shapes, and interesting color patterns, making them a very visible addition to an ornamental model pool. With their delicate swirling tails and obvious side fins, butterfly koi show off well in dollhouse and other scale model water features. Koi can be fairly large fish, so you can make them in a range of scales fairly easily. The koi shown here have bodies which are roughly 6 inches long in scale, but koi can be up to two feet in length, or as tiny as three to four inches. Their colors range from black with various iridescent patterns through to bright gold, silver and variations of orange. Think of how you want to display them in your water setting. They often rest near the top surface of water, or hide beneath the leaves of lilypads. A fairly social fish, they are easily trained to come to be hand fed, so you can also show them heading for a food source. A Good Reference Photograph - There are lots of photographs of various types of butterfly koi online or in books on pond fish. Polymer Clay - in your choice of colors. If possible use strong flexible brands of clay like Fimo Classic, Cernit, Kato or Pardo Clay. You will need translucent clay as well as your favorite koi colors. Metallic or Pearl colors work well if you have them. Tiny No Hole Beads - or you can make eyes from black clay. Fine Pin - for shaping clay. Soft and Medium Stiff Paint Brushes - to add color patches and blend out clay layers and details. Note: - If you are new to using polymer clay, read The Basics of Working with Polymer Clay before starting this project. To shape the bodies of miniature koi from polymer clay, first decide how large you should make your koi. The bodies will be roughly two thirds the length of the fish. For butterfly koi in 1:12 dolls house scale I began with small rolls of clay in my basic body color, and made them roughly 1/2 inch long. Koi can be quite fat, so you can make the rolls 1/8 inch or thicker. Use the photo above to shape the koi bodies, pinching them on one end of your roll to form the narrowed end of the torpedo shape where the tail will join the body. The heads come to a blunt point, which is a bit narrower than the body at the 'shoulders' where the pectoral fins will be. Look at your reference photos to decide which swimming position your koi will be in. In small garden pools, they tend to circle, so their tails curve in towards their heads. If you will be planning a deeper pool , you can make your bodies curve to hang in the water, with the tail well below the head. Koi in larger pools or streambeds may have a straighter body position. Many types of butterfly koi have distincive irregular patches of color on their bodies. To make the most common patterns, the deep orange or red color on silver or white bodies, shape your koi body and add the patches once the body is shaped. To create the patches, roll out a very thin layer of the color you want to use for the patch color. Gently tear off small bits from this thin layer with the head of a pin, and set them in place on the surface of your polymer clay koi body. To blend the patches even with the rest of the koi body, use a medium stiff brush to gently push the patch into the koi body with a 'pouncing' or up and down motion. When the patch is set into the body, use the brush to gently blend the edges so the patch and the body have the same smooth surface. You can use medium stiff bristle brushes to create an allover textured 'scale' pattern on your fish if you wish. Other colored patterns on koi can be made by partially blending translucent and white or pearl clay with colors and making fish which have a partially marbelled or swirled color pattern. Check reference photos to see the colors of real fish for examples. A feature of all koi is their large mouth, which is often seen open! To shape the mouths on your scale miniature koi, use the side of a fine pin or sewing needle to press acros the head of the koi where you want a mouth to be. Then take the end of the pin and hollow out the center of the mouth by working the pin gently around in a circle. You can get koi with varied mouth positions by gently pinching the end of the polymer clay koi's head after you have opened up the mouth. When the mouth is shaped, press black no hole beads gently into the polymer clay on the sides of the fishes head to make the eyes. Leave the beads proud of the head, as koi have eyes that are slightly protruding. If you suspect you will be handling your clay a lot to keep it shaped, you can always add the eyes in last so that they protrude as they should. I like placing eyes early on so I get a sense of how large the head is. The most distinctive feature of "Butterfly" Koi are their delicate streaming tails and fins. To model these in miniature and dolls house scales, roll out a small amount of a mainly transparent mixture of polymer clay to the thinnest layer you can work with. Cut a large triangle (5 scale inches long and four to five scale inches wide or roughly 5/12 inch long for a 1:12 scale koi with a body 1/2 inch long) from your clay and cut into the center at the widest end to form the divided "Y" shape of the butterfly koi's tail. (see photo). Use the side of your pin to gently press vein lines into the tail as shown. To make the pectoral fins for your miniature koi, cut almost equilateral triangles from polymer clay, roughly 3 scale inches in length (or width). Drawn vein lines carefully down the fins, gently teasing apart one edge with the point of your pin as shown in the photo. Leave the fins and the tail to 'stiffen' a bit before you add them to your scale model koi. Transparent clays are usually a bit 'stronger'and more flexible than are colored clays. If you can't get thin fins from your colored clay, try adding a bit more transparent clay to the mix. If you have trouble with these thin fins and tails, take heart, many butterfly koi have stiffer, shorter tails and paddle like fins. If you can't get the thin trailing type correct, try for a more sturdy version of a butterfly koi. To add the flowing tail and pectoral fins to the body of your miniature model butterfly koi, gently lay the narrow undivided end of the tail over the tail end of the koi's body. Use the side of a pin to gently press the tail onto the end of the body, blending it in to the body roughly 1/12 inch up towards the head. You can use the side of a pin, a stiff brush, or a smooth brush to blend the end of the tail into the body. While you are blending make sure you don't lose the divided shape of your koi's tail. When the tail is blended to the body, use the side of your pin to gently lift up the tail flukes and shape them to suit the curve of you koi's body. Look at photos of a swimming koi for refernce to see which way the tail streams. Add the pectoral fins to the body by blending them in place on the sides of the body at the midline, or base of the body, just behind the eyes. Roughly where you would think of the fish 'shoulders' being in proportion to the body. Try to keep the fins spread out flat, or a bit like seal flippers, to help them hold their shape. Let the clay 'rest' to stiffen up a bit, then carefully move your fish to your baking tile or foil tray. 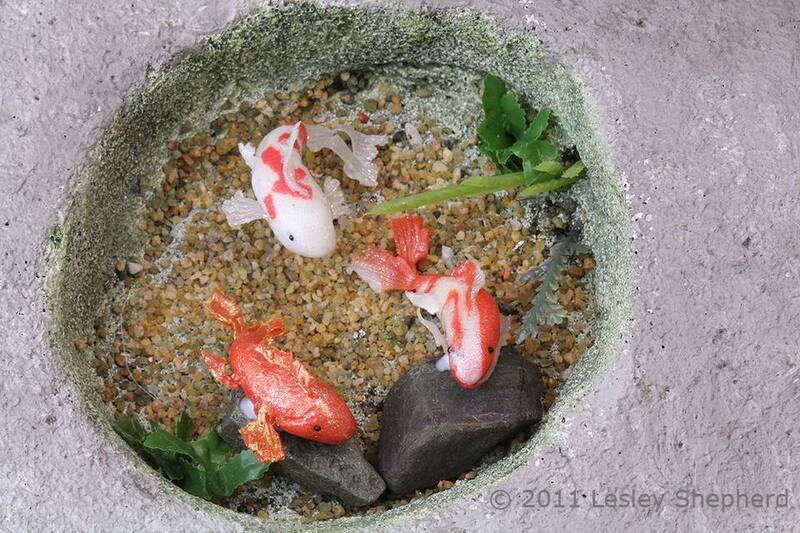 To make your model koi look realistic in a model pond setting, pose them in various swimmimg positions. Koi naturally 'swarm' in a small space, so you can set up your model fish in positons which will allow them to overlap each other. To pose them so that they appear to be rising from the bottom of a pool, use a bit of polyester quilt batting to support their shape. If you will be putting them into a very shallow pool, lay them flat on your baking tile, but curl their bodies to show off their tails and fins. Make sure you set your koi in a stable position on your baking tile or tray. You still need to add the final dorsal and pelvic fins before your koi are ready to cure in the oven. I've left adding the dorsal and pectoral fins until the last when making my miniature butterfly koi from polymer clay. Once the dorsal fin on the koi's back is in place it is very difficult to move the fish around until after the polymer clay has cured. To make the dorsal fin, roll some of your transparent 'fin' blend clay out as thin as possible. Use your polymer clay knife to cut a narrow band of clay, just over half the body length of the fish and roughly 1 1/2 inches in scale wide (3/24 inch for 1:12 scale fish). Mark the bone lines in up and down across the narrow width of the fin so they will point up when the fin is fitted to the back of the fish. Gently pick up the fin with the back of a craft knife or polymer clay blade and drop it on top of the fish back, just back of where you placed the pectoral fins on the sides. Use the side edge of a fine pin or embossing tool to press the base of the fin along the center line of the fishes back, blending the fin into the body. Use a soft brush to smooth out the blend. Use the clay knife or craft knife to trim the length of the dorsal fin to the length shown on your reference photo. Now blend the bottom edge on the other side of the fin so that it is smoothly blended into the back of the fish. Use a brush to make sure the blend line is not visble. Trim two narrow triangles from very thin "fin" clay for the pelvic fins which are quite prominent in butterfly koi. These are narrower than the front pectoral fins, but about the same length. Fit these fins to the base of the fish body before the tail, rougly in the place you would expect to find 'legs' or 'feet'. See the photo above for reference or use your reference photo for the correct position. Use the side of a pin and a brush to gently smooth the bottom edge of the fin into the body of the fish. Set the fins so they are in the correct swimming position for the posture of your fish. Use a soft brush to do any final blending or shaping on your miniature butterfly koi before you cure or 'bake' it in the oven at the correct temperature for your clay. The fins and tails are very thin, so make sure you don't overbake your clay. If the fins are much thinner than the body, and you are worried about them discoloring, you can cover them with a bit of foil to insulate them a bit. As these koi are not over 1/4 inch in thickness anywhere, you can usually cure them in ten minutes or so at the correct temperature. Allow your cured polymer clay koi to cool, then carefully remove them from their baking tile or pan. Lay them out to check possible grouped swimming positions in order to see what kind of group you want your koi to be in once you set them in their final setting. As your koi are made from polymer clay, you can glue them in place in a pool and cover them with two part epoxy resin, or melted plastic 'water'like E-Z Water. You can also avoid permanently encasing your koi and cover the pool with a thin piece of glass or clear acrylic or styrene, coated to make it resemble water. When you work out the positions for your koi, consider how deep your water feature will be, and whether you intend to add pondscaping, rocks or plants, around the edges of your pool. You want your careful work on your lovely butterfly koi fins to show off! The koi can be glued to rocks, stiff plastic plants or glued to support stakes (toothpics or wires) painted to blend into the color of your pool. To help your koi stand out in the model scale or dollhouse pool, you can add a bit of iridescence or glitter to their bodies to resemble the shine of scales in sunlight. I do this at the same time I coat their bodies with a gloss layer of acrylic finish to make them look 'wet', especially if I am going to leave them in open pools with a clear cover, rather than encasing them in plastic. To make the iridescent or glitter effect of scales, mix a small amount of mica pigment like Jacquard Pearl-Ex Pigments or an iridescent paint (Daniel Smith sell several colors of iridescent watercolors) or iridescent medium like Windsor Newton Iridescent Medium. in your choice of colors into the gloss acrylic (or a layer of clear drying pva glue) and stoke the coating over the entire body of the fish in a very thin layer. Set the miniature koi aside to dry. If you have used pearl or other mica colored polymer clays, you may only need to apply a layer of gloss acrylic to bring out the mica sheen effect. Take care not to apply to thick a layer of the mica pigment or iridescent paint. To position your model koi in a scale model pond or dollhouse garden pool, you can glue them to features in the landscape of the pond, rocks or stiff plastic pond weeds, glue them to the base of the pool, or glue them to support set into the bottom of the pool. If you want to set them in a particular swimming position, first check that they will fit below the proposed surface of the pool in that position, then either glue them to a support wire (see above) or use a pin vice or mini drill to drill a small hole in the stomach of the koi (angled to accept the wire and hold the koi in the correct position) and then glue the wire into the hole. The method and glue you use will depend on how you want to finish the water effect for your miniature pond. Make sure any glues or supports you use are compatible with the material you will use for water, and that the material will not create air bubbles in your water effect. Paper or thread wrapped wire and twigs can cause air bubbles in plastic or resin water effects. Secure your koi to your support and leave it to set in place. When your koi are in their permanent positions, you can finish your pool display. Don't forget there are other places to use your tiny koi. They can be kept in buckets or wash tubs while model pools are being built or cleaned in scenes, and they can also be put in water filled plastic bags as if they were being transported. Of course you can always use them for jewelry or miniature lamp bases as well.